Gareth Steele aims to be world champ, and he and his wife bought a pool hall to help make that happen. WINDHAM — Gareth Steele doesn’t sound like he’s bragging when he says it, but as if he’s simply stating a fact: He will be the world champion of pool. “Probably in three or four years– within the next five years, without a doubt,” he said last week. 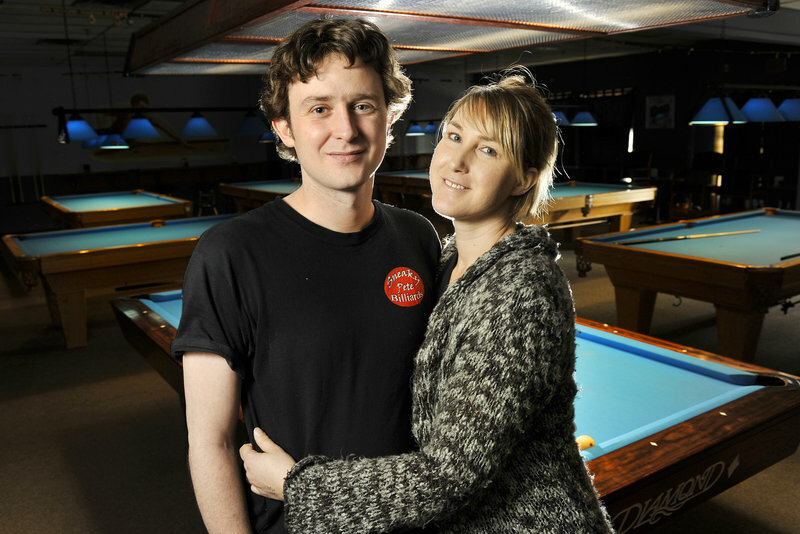 Steele, a 32-year-old Denmark man with a boyish face and a British accent, took home the championship trophy in the state nine-ball tournament earlier this month at TJ’s Classic Billiards in Waterville. It was Steele’s third appearance at the event. The first time, he came in ninth place. Last year, he was the runner-up. “I’m still improving quickly,” he said. By Steele’s calculations, global dominance is inevitable. It was only five years ago that he started to get serious about playing pool. And now he has unlimited access to practice space. In October, Steele and his wife, Jacqueline, bought a pool hall at the end of a strip mall on Route 302 in Windham in the hope that the profits could cover entry fees and travel expenses for him to play in professional tournaments. They changed the name from Sebago Lake Billiards to Sneaky Pete, after the term for a high quality pool cue that’s made to look like an average house cue. Jacqueline Steele said the name is reflective of their former lifestyle. “We were just a couple of hustlers,” she said. The Steeles met about 10 years ago in England, where he’d lived all his life and where she moved from California as a child. Both free spirits, they immediately recognized their shared philosophy on life and became inseparable, said Jacqueline. What she didn’t realize right away was that her now-husband was in the depths of a cocaine addiction. Soon, she said, she took on the same habits and both of them lived a hard-partying lifestyle for years – until she couldn’t take it anymore. Eventually, she said, she had to get away from the drugs and their addict friends, and told him he could come with her or not. It took time, with some slip-ups and break-ups along the way, for Gareth Steele to drop his drug habit, then tackle a drinking problem. But upon returning to England after the couple took a three-month trip to America, Steele decided to shift his focus to something new – becoming a professional pool player. “I was good at it, and I didn’t want to be in an office,” he said of the reasoning behind his career choice. Steele, whose billiards experience was limited to playing snooker recreationally as a teenager, rose in the ranks of amateur pool play in England within a couple of years. Soon after the birth of their now 2-year-old son Kai, the Steeles decided to move to the United States to be closer to Jacqueline’s aging mother, with whom they live in Denmark. Steele got involved in the pool scene right away, and the couple started a website, newengland9ball.com, where they rank players and post tournament results. One of the people Steele met soon after moving to Maine was Steve Reynolds, owner of TJ’s Billiards. Reynolds remembers beating Steele in the first game of pool they ever played. “I would have a tough time doing that these days,” he said. In 2010, Steele and Reynolds set the Guinness World Record for the longest marathon billiards match at 74 hours, with five minutes of break time allotted for every hour of play. At the end of it, Reynolds said, Steele could have kept going. Reynolds said Steele is now considered among the best in Maine – a state that’s known for producing top-notch players, including 24-year-old Waterville native Mike Dechaine, who was ranked No. 1 in the country last year. 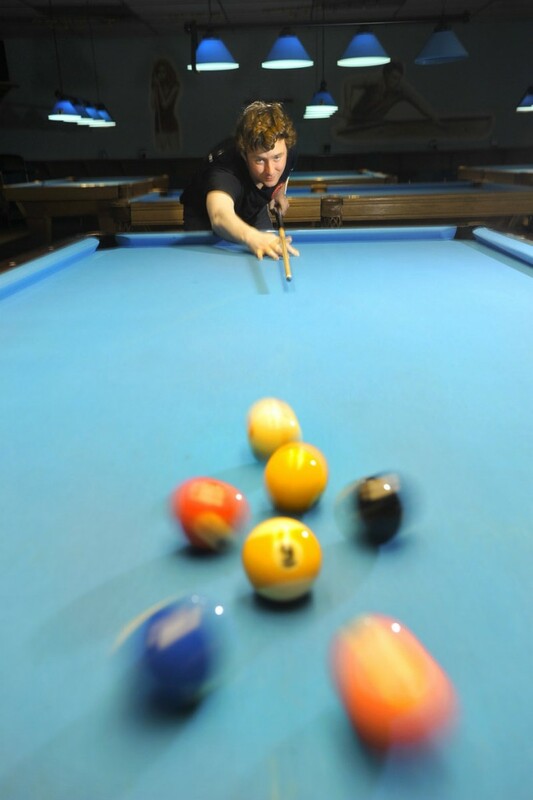 Now that he’s won the Maine nine-ball championship, Steele said he’ll focus on out-of-state tournaments with bigger pots – and running a profitable business to cover the costs of playing. Money, Steele said, isn’t his main motivation. “It’s loving the game and wanting to be the best,” he said. So, what about once he’s world champion? “I’ll have to find something else, I guess,” Steele said.